Lock out the distributor. Low timing at idle is fine for street cars, but is not part of the equation for a high performance engine. Your restarts will be crisper with full timing. The ideal timing for the crate engine is 36 degrees. However; if you are running pump gas, you may need to lower the timing to avoid detonation and you will lose horsepower and torque. We are finding that most crate engines are leaving the factory with a resistor plug installed or at least a spark plug from a heat range that is too hot. The Champion plug number for the crate is S61YC. We are most familiar with Champion’s number system after 5 years as a race engineer with them, but you can certainly cross reference that number to your favorite brand – Autolite AR94, NGK R5724-8. There is no performance gain or loss from brand to brand because all the plug needs to do is generate a spark to light the fuel. Gap your plugs on .035, not .045 as suggested on most valve covers. There is no performance advantage to wider gaps and they can cause a misfire or stumble. A crate engine is a race engine and must be fed the proper octane. DO NOT run pump gas or any mixture involving it. Pump gas is not reliable or consistent from batch to batch, pump to pump, season to season. And, the additives in it that are necessary to get it to burn are corrosive and will eventually eat the glue out of the power valves, deteriorate the gaskets, break down the foam in the fuel cell, rust steel parts in the engine, etc. With 9.5 : 1 compression, crate engines need a good leaded 110 octane race fuel. We will not make a jetting recommendation for the use of pump gas due to the inconsistency and instability of the blend. 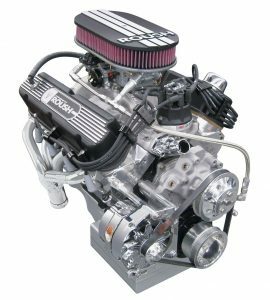 Oxygenated fuels are certainly available and can give more horsepower if the carburetor is jetted correctly on an engine dyno. If not, the benefits will be lost. Oxygenated fuels must also be stored in a cool environment in a sealed non-transparent container. If not, the light ends will evaporate off and leave you with an unknown fuel. The use of oxygenated fuels must also be accompanied with a stringent maintenance program after every race weekend. If not, you will face the same corrosive issues as in the use of pump gas. Would you go to the track without an air pressure gauge? Then, don’t go without a fuel pressure gauge. 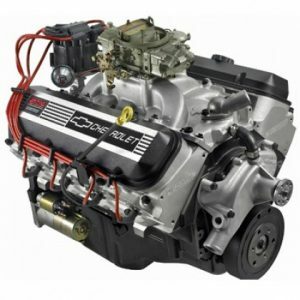 6-7 pounds of fuel pressure is the ideal range for your crate engine; BUT, be aware that a fuel pump designated as 6 pounds on the box may not pump 6 pounds because of all the variables involved in your specific engine: cam lobe for the pump, length of the pump arm, and the diaphragms and springs installed in the pump. A fuel pressure gauge installed on the dash is the only option in our opinion, and a simple bulkhead fuel pressure regulator installed between the fuel pump and the carburetor will make this a worry-free setup. The driver can see the gauge and will then be able to diagnose any issues by watching the movement of the needle in relationship with the throttle input. Actually, the gauge needle should not move at all and should be rock solid like an oil pressure gauge from idle to wide open. A bouncing needle will indicate air in the fuel line due to vapor locking, a collapsed or split line, a loose fitting, bad placement of the pickup in the cell, etc. Movement of the needle between idle and wide open will also indicate a poorly-functioning pump or clogged fuel filter. So, install a gauge on the dash, set the regulator on 6.5 pounds, and eliminate the worry. A properly designed carburetor will get the most horsepower out of your crate engine and will make restarts smoother and crisper. That is VDL’s forte: a custom built 650 HP or 750 HP or 4412 carburetor built specific for your crate engine and class of car. A DIRT Sportsman crate is not the same as an asphalt Pro Late Model crate; and a 602 crate is not the same as a 603 or 604 or 525 or 347. We are ready to build the carburetor you need, just for you, one at a time.